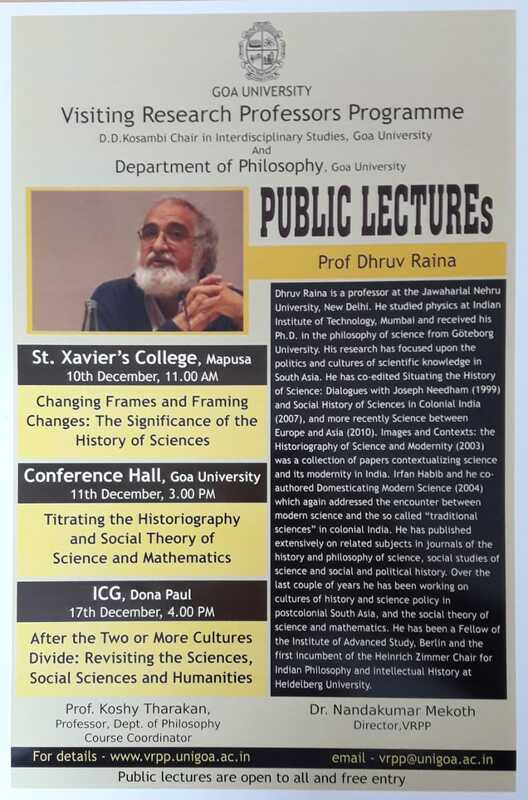 The Department of Philosophy and Physics, St Xavier’s College are jointly hosting a public lecture by Dr Dhruv Raina, Visiting Research Professor, Goa University at St. Xavier’s College, Mapusa on 10th December 2018 at 11.00am at the Conference Hall. The title of the lecture is “Changing Frames and Framing Changes: The Significance of the History of Sciences”. Dr Dhruv Raina is a Professor, Zakir Husain Centre for Educational Studies, School of Social Sciences, Jawaharlal Nehru University, New Delhi 110067, India. An erudite scholar, he has extensively authored books and published articles in international and national journals. He has held esteemed positions as Honourary Director, Northern Regional Centre, Indian Council for Social Science Research, New Delhi (2012 – 2015), Heinrich Zimmer Chair for Indian Philosophy and Intellectual History, Ruprecht-Karls-Universität Heidelberg, Germany, (2010 -2011), Adjunct Professor of History of Science, Indian Institute of Science Education and Research, Chandigarh, (2010-2014 ), Faculty, The Young India Fellowship, New Delhi (2011 – 2012), Professor and Chairperson, Zakir Husain Centre for Educational Studies, Jawaharlal Nehru University, New Delhi, (2009 -2010 ) Fellow, Wissenschaftskolleg zu Berlin, Institute of Advanced Study, Berlin (2007-2008) amongst many. The public lecture is a part of lecture series organised under the Visiting Research Professors Programme, D.D. Kosambi Chair in Interdisciplinary Studies, Goa University and Dept. of Philosophy, Goa University.